This colourful noodle salad will awaken your taste buds. Prawns are perfect for a fast meal because they cook so quickly. The trick to making stir-fries is to have all the ingredients prepped and ready to go before you start cooking. 1. Remove the outer leaves from the lemongrass stalk and cut away the though upper half and the base. Cut the stalk in half to reveal the tender core and finely dice this part. 2. Put the lemongrass into a clean screw-top jar along with the rest of the ingredients. Close and shake to combine. 3. Store in the fridge for up to five days, give it a good shake again before using. 1. To toast the nuts, heat a heavy-based, dry frying pan over a medium heat. Add the nuts and cook, stirring, for a few minutes, just until they start to brown. Tip the nuts out of the pan and set aside. 2. Place the mung bean noodles in a large bowl or pan filled with hot water and let them soak for 5 minutes, until tender, then drain well (or cook the noodles according to the packet instructions). 3. While the noodles are soaking, heat the sesame oil in a wok or a large frying pan over a medium-high heat. Add the mangetout, red pepper, red onion, broccoli, chilli, garlic and the diced lemongrass and cook for 2–3 minutes, until the vegetables are just starting to soften. 5. Add the prawns, lime juice and toasted nuts and cook for 2–3 minutes more, until the prawns are just cooked through and pink. and serve straight away garnished with a few more fresh coriander leaves. Roz Purcell’s approach to cooking is simple: use whole foods to live a whole life. Having developed a negative relationship with food that led her to make unhealthy choices, she cured herself by rediscovering her love of cooking from scratch. She used her passion for food to experiment with flavours and textures and develop the most amazing recipes that fuel the body, providing the energy and vitality needed to look and feel great. Roz began blogging at naturalbornfeeder.com in 2013 to document her love of cooking and to share her recipes. Now in her highly-anticipated cookbook, written with the same wonderfully accessible approach, she features over 170 easy-to-follow, delicious recipes that prove whole foods can taste far better than a pre-packaged meal. In Natural Born Feeder, you will find recipes for smoothies, juices and drinks, countless ways to “Pimp your Porridge” and plenty of Roz’s famous Pancakes and Crepes. There’s also recipes for soups, salads, sides, main dishes, simple pleasures, desserts, breads, sports snacks, dips and “The Nut Butter Collective”. Plenty of inspiration to get into the kitchen, and get cooking! 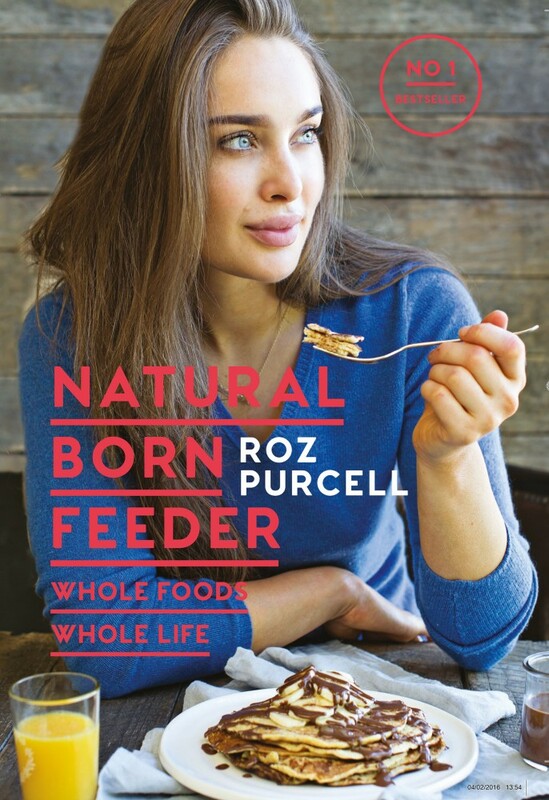 Natural Born Feeder is published by Gill Books, priced at €27.99.